In the 40 years since the end of World War II, Japan has become the superstar of the industrial world. This resource-poor nation, which must import nearly all its raw materials, has become a top iron and steel producer, and one of the world's leading shipbuilders. Japanese electronic goods dominate world markets. Japanese factories are at the forefront of new techniques and technological innovation. The last 20 years have seen a steady rise in the standard of living. Japanese people are now the most prosperous in Asia. Japan is one of the most developed countries in the world. The spectacular rise of modern Japan from the ruins of war has been one of history's most remarkable success stories, but it has proved to be a mixed blessing. As prosperity increased, so have strikes, social unrest, and juvenile delinquency. The stable and conservative values of traditional Japan had begun to crumble against the onslaught of a modern materialistic, consumer society. Has Japan really understood what brings true, lasting success? For the past 17 years, I have known many of the top officials in the Japanese government, and through them I've become acquainted with a major Japanese industrialist, Mr. Takeyoshi Yamaguchi. On my recent visit to Tokyo, Mr. Yamaguchi asked me to speak to a few thousand of his employees. And I did address them at an auditorium near one of his plants in Tokyo. In Tokyo, Mr. Armstrong was driven to the Chinzanso Garden Restaurant, where several thousand senior sales staff of Japan Life Industries were meeting. Before Mr. Armstrong spoke, he presented Mr. Yamaguchi, chairman of the company, with an autographed leather-bound copy of his book The Seven Laws of Success, and a copy of the same in the Japanese language. Meanwhile, the booklet in Japanese was distributed to the employees of Japan Life. Well, good afternoon, ladies and gentlemen. It is indeed a great honor and privilege to be able to speak to you here this afternoon. I think that every one of us should want to be a success in life, but we live in a world where half of the people, or more than half of the people in the world today are living in abject poverty, and in filth and squalor. While Mr. Armstrong spoke, Professor Fujita of Tokyo's Reseda University translated in Japanese. For brevity, only portions of translations are included. And even the other half of the people in the world today, who may have plenty economically; they have enough to eat, enough to eat, enough to wear, they have food and shelter, but they are not happy, and they are really not successful. As you'll read in the booklet that has been handed out to you today, I have known and talked with many of the men that have been presidents or chairmen of the board of great corporations and great banks in the United States. They were men who had made a great deal of money, but as you will read in the booklet that you have received today, I found that those men were not happy. Just having money that will buy the material things in this world is not the source of happiness. The more these men had in money, the more they wanted, and the less satisfied they were. Most of those men, and you will find in the pictures of two of them in the booklet you have, and they died many years ago, they were well along in years when I knew them and I was quite a young man then, so they've been dead a long time — they did not take their money with them when they died. There's only one thing that we can build in this life, that we can acquire, and then we can take with us when we die, and there is only the one thing that we can acquire in this life and that will make life enjoyable and happy and truly successful that we could call a success in life. And that one thing is the development of righteous character. And righteous character is what we develop within ourselves and in our own minds, and that character is the ability to come to really know what is right from what is wrong, to follow what is right and to have the willpower to do what is right, and what we ought to do, instead of perhaps what we might want to do that is wrong. In economic development, you are living in the second greatest country in the world, next to the United States. Your economy is greater than that of China or of Russia, or of India, all of whom have more people and greater populations, but they are not as successful economically. But what are the laws of a happy, successful life? Do you know that just as there is the law of gravity... Now they have given me a glass of water, which I am not going to need, but if I let loose of that, something's going to pull it down. That's a law, and we call that law gravity. It makes everything come down to the Earth. Now in the same way, there are definite laws set in motion that determine success and enjoyment, and real happiness, that are rewarding in life. You will find those laws are outlined in the booklet that you have all received today. And the first law is choosing the right vocation. Now I assume that all of you are already committed to your economic vocation in life. You have your job and your way of earning a living, but there is still something else in choosing the right goal, and that is to develop the right kind of righteous character that I mentioned a while ago. Now in that goal, if you're going to achieve it, I'll come back to what I was saying that Mr. Yamaguchi mentioned, that I said at the banquet last night. There are the two ways, and one is the way of give, and the other is the way of get. Whatever you do, if you are employed and you work for a company, if you, the more you give of the best that you have of your talents, of your honesty, of faithfulness, in every way, the more righteous character you develop and the happier you will be. So the first law of success is choosing the right goal in life. Now, the second law of success then, is acquiring the right knowledge, the know-how to achieve that goal, and to live in a way that will make you a success. You should study to educate yourself for your job, that you can do your job better, because the very law of success will cause you to step on up in the ladder of success, if you are acquiring more knowledge, more of the know-how, and learning more how to do whatever job you're doing. We should all continue to study, because education is of the mind, and it is a lifelong process. We never stop learning, and if the mind stagnates, you just get very old in every way, and finally you give up and die. So always keep learning more and more, and keep your minds active. Now, the third law of success, and this is a law, it'll work every time, is if you're going to be a success, you're going to have to have energy. You have to have vitality. I am now in my 93rd year, but I have seen many people only 55 or 60 years old, who look and appear in every way much older than I do. The next thing, if you're going to be a success, you have to drive yourself. You have to cause yourself to, well, get up in the morning when you want to turn over and sleep a little longer, and you have to drive yourself to do what you ought to do, instead of just giving up to do what maybe you'd like to do. When you're employed, and you work for a company, drive yourself to work as hard as you can, and to do the job the best you can. After having the right purpose and goal in life, and studying to educate yourself and to have the know-how to do the job, and driving yourself, the next thing is you're going to run into many problems and many snags in your life, and it's going to, you're going to find that great obstacles confront you sometimes. So that law of success is simply resourcefulness. You have to be able to think your way around every problem that comes up in your life. Now the sixth law of success then, is sticking to it, and never giving up, and never quitting, or perseverance. We should never give up. Many people have given up and quit when if they had just stayed on a little longer, their lives might have been a great success. Now the seventh law really should come first, because that comes in choosing the right goal in the first place. We human beings did not just happen here. There was a great creator who had to think out and plan and design our minds and our bodies, and create us and put us together, and give us life, and give us the means of sustaining that life here on this Earth. This creator God showed that very first man that the right way of life is the way of love, that there would be other humans on Earth, and that he must learn to love other people as much as himself. He must be generous, he must cooperate, he must try to help others, and be kind to them, and giving and cooperating and helping. But that very first man who ever lived, decided he knew more than his maker and creator. And so, he decided that the best way was to get and take away from other people, that the best way was to be selfish and only think of yourself. So soon, that first man lost all knowledge of this creator and maker, and of what his creator had told him, and he, and then he had children, and he started them out, and all of them began to live the way of selfishness, and of just wanting to get, the way of competing against others, of trying to take all they could get for themselves, and not having any concern for others, but only for their own selves. So soon, they and all of their children, and all of humanity that has been coming along for 6,000 years, soon forgot about the creator and their maker, and so we have had violence and war, and troubles in the world ever since. But the way we ought to live, and the only way that will make us happy and bring us to real success, is to follow those same seven laws that are in this book, and they are the same principles that the original creator gave to the very first human being that he created on Earth. So I hope that you will all read this booklet that you have, and that you will enjoy it. I hope it will help you, help you to be more successful, help you to be happier, and I think we will all be happier and have love for one another, which is much better than having hate and competition, and antagonism, and resentments, and bitterness, and all of that sort of thing, which we want to get out of our minds and hearts, and just have love for one another. [applause] Thank you, everybody! Now, I have here one of the booklets that was handed out to the employees of Mr. Yamaguchi in Tokyo, in the Japanese language, which you can see here. I think most of you won't be able to read that, but I also have it here in English. The Seven Laws of Success. They are the laws that every successful man has had to follow, and most of them have only followed the first six of those laws that brought financial success, but not real happiness, and not real success after all. You need all seven laws to know what real success is. Now you may have a copy of this in the English language, or if you speak Japanese, you may have one in the Japanese language. And in due time, they will be published in several other languages — The Seven Laws of Success. They are the laws of God Almighty. They are the laws that have been followed by every successful man in history. Now also, I'd like to offer you with it another booklet, which I've announced once or twice before — A World Held Captive, A World Held Captive. This world has been enslaved. It's really been enslaved in sin, but it hasn't even known what sin is. Jesus Christ came to ransom us from this captivity, and he paid the ransom price, and to deliver us from the captivity, and from sin. And many people don't even realize what sin is. Humans do not know. God intended to reveal it to Adam in the Tree of Life, but he didn't choose that tree, he chose rather a tree of death, in which he would decide for himself what is sin, and that's what human beings have been doing ever since. This is a booklet that will explain to you what is wrong in the world and how it has come about, that we're in a world of awesome progress, and at the same time, of increasing and rapidly multiplying evils, and humanity cannot find the solution of all of our problems and our troubles. This will explain why we cannot solve our problems, even though we do marvelous things technologically, and scientifically, but yet we don't find happiness. Now at the same time, I would like to offer you a year's subscription to The Plain Truth. Now there's no subscription price. There's no charge for the booklets, and we don't ask for money. There'll be no follow-up requesting money in any way. Here's a recent issue of The Plain Truth, with a big article on the subject that is one of the red-hottest subjects in the world today — abortion. The Plain Truth is a magazine of understanding. It is a news magazine. It doesn't report news, but it does tell you the meaning behind the world news, and the international news. Here's an editorial by me: Men Didn't Teach Me What I Preach. Here's an article, well, it's the cover story: The Plain Truth About Abortion, and Why It's So Little Understood. Here's an article: The Key to Human Survival. The world's number one problem today is that of human survival. The weapons exist that can erase all human life from off the Earth if there is another nuclear war, and Bible prophecy says such war will come, and unless God Almighty intervenes, human life will erased from this Earth. But God will intervene in time. You need to know about it. Here's an article: For Teen Eyes Only. You're not supposed to read that. If you do, I don't think anyone's going to catch you. Here's another one: Drought, Famine, War...Has God Lost Control? If there is a God, why does he allow all of these things? Here is another: The Teen Years. You know, I think that would interest young people, even up to the age of 92 or 93, as I am. Well, here's another article: You and Your Money. I don't think there's any thing people are more interested in than that. You and Your Money, and on your finances. Here's another article in this issue: Finding A Way Out of Fear and Depression, Finding A Way Out of Fear and Depression. And other articles in this recent issue. Now, The Plain Truth is well-illustrated. It is really the finest magazine on Earth, one of the largest circulations of any magazine published, larger than any news magazine published in the United States or England, or Germany, or where you have news magazines. Circulation now is approaching eight million, and it probably is read by about 25 or 30 million people all around the world. It's published in seven different languages. Now there's no subscription price, and no charge for the booklets. You may have them just for the asking, and there'll be no follow-up requesting money. You just send your request to me, Herbert W. Armstrong, and the only address you need is Pasadena, California. The zip code is 91123. But better yet, go to the telephone and just call for it right now, and it's all done and taken care of with no trouble. It's a free call — you just dial 1-800-423-4444. Now thousands are calling in. We have several hundred waiting to take your call. If the lines are busy, call again, so jot this number down. 1-800-423-4444. 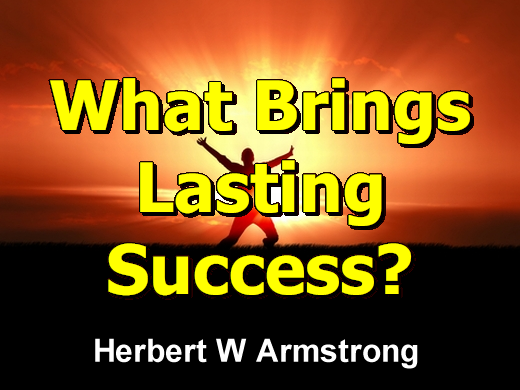 And so, until next time, this is Herbert W. Armstrong. Goodbye, friends.